Dinner tonight is Cubano all the way. I have made this lineup (minus the cake) containing our favorite flavors from the unique island culture of Cuba before. I like to think that it brings a taste of Little Havana up from the land of palm trees to the great Midwest to help jump start the early summer. The temperature outside says that the jump start isn't working, but the flavors work on multiple levels. 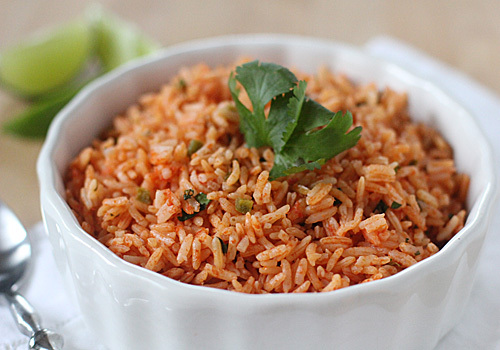 The recipe that I am featuring is somewhat apart from the Cuban theme. 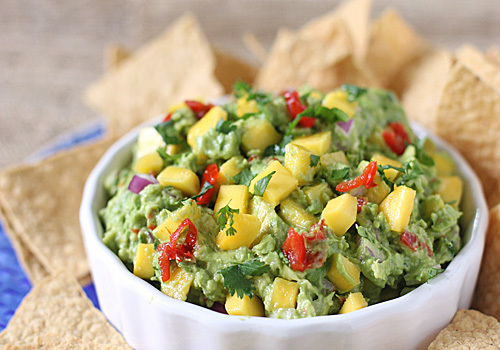 We all love guacamole, but I wanted to add a tropical, Caribbean essence to it to bring it more in line with the rest of the flavors. The mango provides just the essence I was looking for. 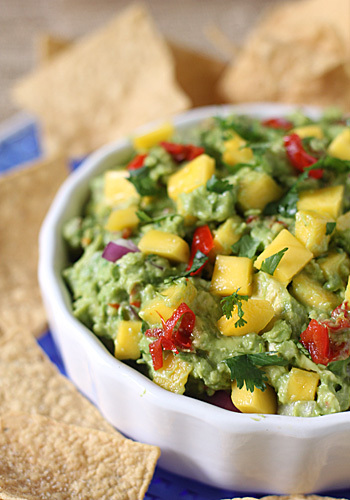 Another interesting addition to this guacamole is the flavor from the Peppadew peppers. They add a sweet, piquant note that really makes this chip dip unique. I know that I'm jumping around with the recipes this week, but we enjoyed this cake last Sunday and it will be some time before I make it again and I want to get it out there. Why will it be some time before I make it again? 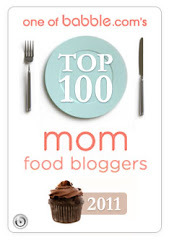 Well, there are just too many other delicious dessert recipes to make and try☺. 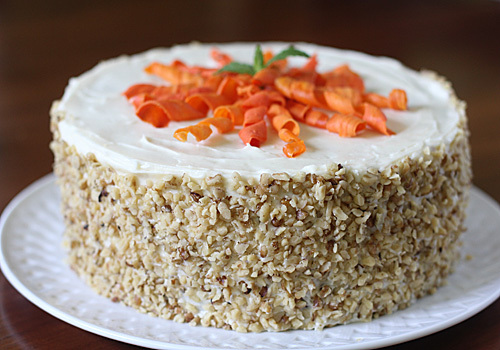 That, and I have had a few requests for a carrot cake recipe. This one is outstanding! 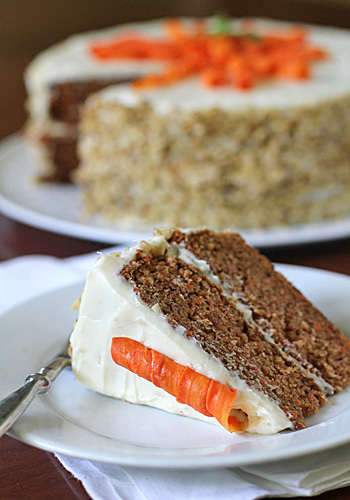 Normally, carrot cake recipes are incredibly moist due to the carrots and obscene amounts of oil. I mean 1 1/2 cups of oil-- really?! I am not one who is afraid of a little fat, but I don't care to have greasy lips after taking a bite of cake. To eliminate that problem without sacrificing taste and texture, I replace 1/2 cup of oil with buttermilk and use a full pound of carrots. 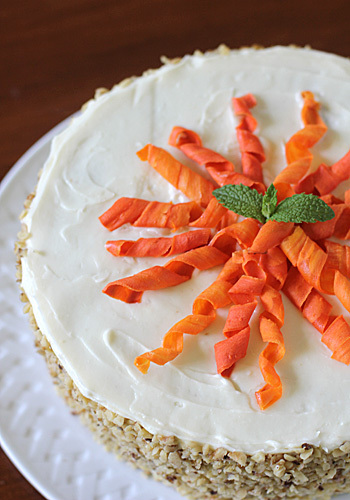 Now that is a carrot cake. I keep the spices and frosting traditional, but I give the finished cake an updated twist (literally). Instead of a 9x13-inch cake pan with a simple frosted top that many of us probably grew up with, I like to make this cake into a two tiered cake with crisp candied carrot curls on top. Completely optional, but it does make for a nice presentation and a great snack for the kids. However, a simple 9x13-inch pan is still a good and equally tasty option. Speaking of options, the nuts are optional too, but I do like the bit of texture that they add. You can even add the nuts to the cake batter instead of using them as a garnish. Like many cake recipes, it can be made several days in advance and kept in the refrigerator. Just bring it to room temperature before serving. I apologize. I have been keeping this recipe all to myself. It's not that I didn't want to share. I just needed to make a few dozen batches and do a little taste testing to make sure they were just right to share☺. 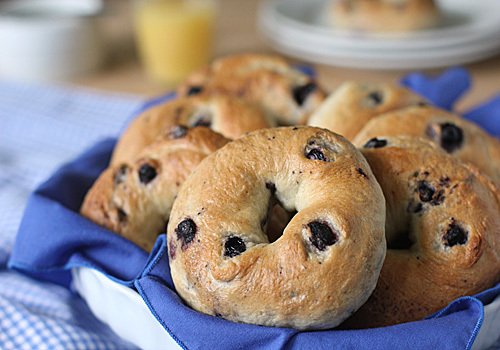 When I first started toying with the idea of a blueberry bagel, I knew I wouldn't have many options in terms of the type of blueberry I was going to use. I wanted the taste and texture of a fresh blueberry, but not the watery mess. I also wanted a slight purple tint that made it look like a blueberry bagel, but without any artificial color added. The obvious choice would be to use dried blueberries, but I knew they wouldn't give me that streaked blueberry look to the bagel. Frozen blueberries would be an even bigger disaster than fresh. Hmmm...."....self, don't give up." Cruisin' through the aisles at the market, I found my answer-- freeze-dried blueberries! 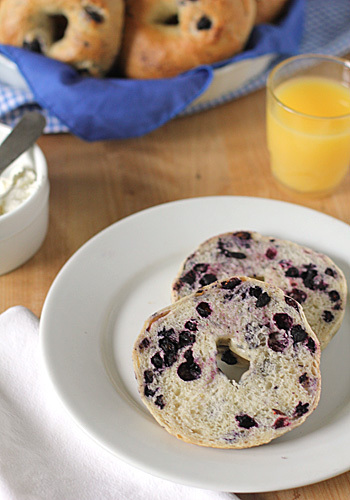 They are made from fresh blueberries picked at their peak for the best blueberry flavor. A 1.2-ounce package (about 1 cup) of freeze-dried blueberries is actually 8.5-ounces of fresh blueberries. Now that's a lot of blueberry for my bagels. Since they are on the brittle side, I gently knead them into the dough by hand. They soften once baked and they give the bagels that little purple streak I was looking for. To further enhance the blueberry flavor, I first add a bit more sugar. Then I add a touch of cinnamon and lemon zest just like I do with my blueberry pie. The flavors really compliment one another. Just look at all those berries! Toast one up and spread it with butter or cream cheese for breakfast or an anytime treat. If you are new to making bagels, check out my step-by-step photos for homemade bagels. I am sure it is not a surprise to you that I love chocolate. Just check out the dessert section in my recipe tab. I even put cocoa in my chili! Having said that, I have never been a big fan of plain chocolate ice cream (until now). It just seemed so... meh. Good, but... meh. You see, I like to take other flavors and use them as blank canvases to which I can add chocolate☺. A scoop of vanilla ice cream with chocolate sauce-- yes! And of course, I do stir it together to make chocolate soup ice cream. 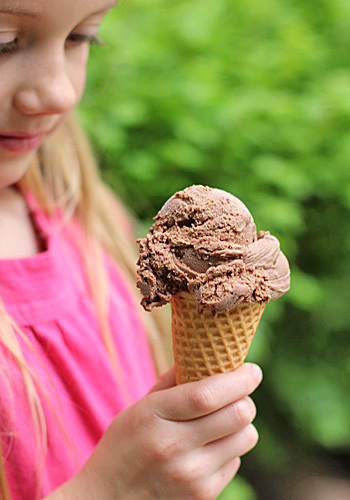 A scoop of coffee ice cream with chocolate chunks-- oh, yes! 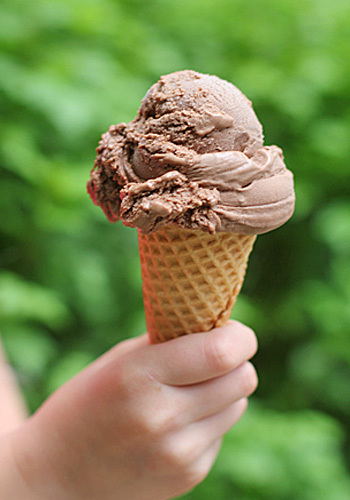 A scoop of tiramisù ice cream with a chocolate ripple-- come to mama!! My youngest daughter, on the other hand, could eat double her weight in chocolate ice cream on a daily basis. A blood test might show that she has a river of melted chocolate running through her veins. Wanting to treat her after her first soccer win of the season, I whipped up a batch using a recipe from my ice cream bible. I knew she was going to love it, but what about me and my... mehs? Verdict-- this is hands down the BEST chocolate ice cream I have ever put in my mouth. I sound like a southerner when I say that, but it is true. I can't even begin to describe how creamy it is straight from the freezer. It might have something to do with the tablespoon of chocolate liqueur that I put in it☺. This is a little trick that I use for many ice cream recipes to keep them from freezing rock hard since home ice cream makers don't incorporate enough air in the ice cream like the commercial brands do. Of course, it is optional and the ice cream will still be great without the liqueur, but I do recommend it. You know what might even be better than plain chocolate ice cream? Using chocolate ice cream as a blank canvas to add more chocolate-- whoo-hoo! "Mommy, can I eat it now? Mommy, can I eat it NOW?!" A big thanks to my daughter Mabelle, who patiently waited to eat her ice cream while I snapped a picture or two. Here they are. 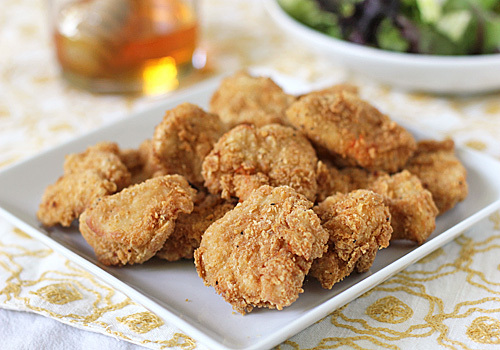 They are world renowned for their ability to double as kid favorite and parent bail-out meal-- Chicken Nuggets. How many times have you pulled out of the drive-through lane or dumped rock hard artifacts from the freezer onto a baking sheet and thought--"I'm glad the kids are getting their dimethylpolysiloxane (that's a real ingredient) today." It must taste pretty good, because my middle daughter loves chicken nuggets. I really wanted to find an alternative to all of the artificial chemistry lab stuff--a more wholesome version and one that I would enjoy as well. If you follow the procedure below, I think you'll find a good way to get your kids the delicious nuggets they love that you can also feel good about. 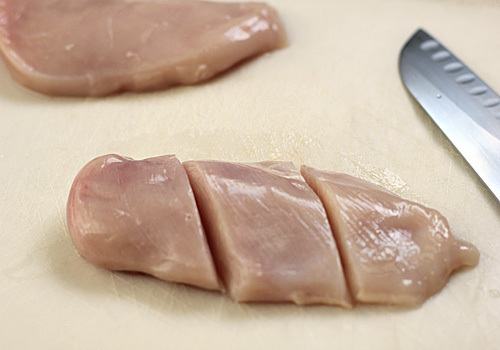 Cut each chicken breast diagonally into thirds. Working with the largest piece, turn the cut side towards you and slice into 1/2-inch thick pieces. 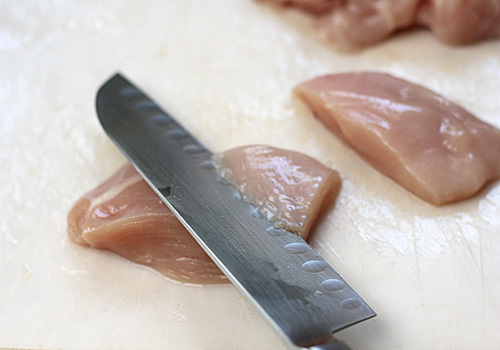 With your knife almost parallel to the cutting board, cut the two smaller thirds into pieces. 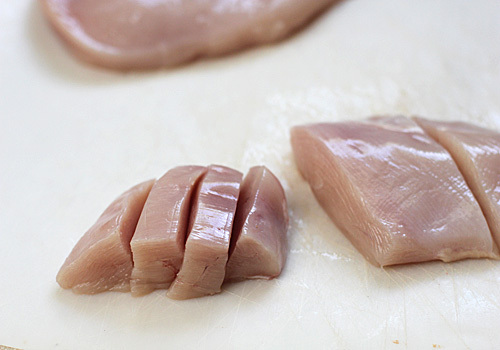 Continue with remaining chicken breasts. 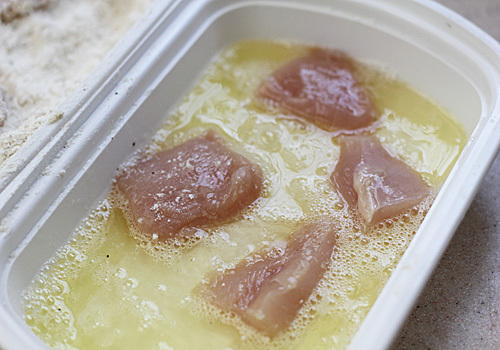 Place the chicken pieces in the brine, cover and refrigerate for 30 minutes. 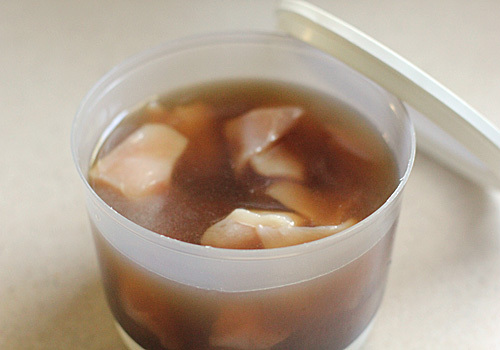 This keeps the chicken moist and flavorful. 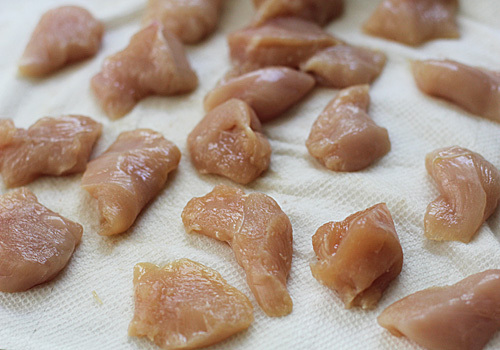 Dry the chicken on paper towels. 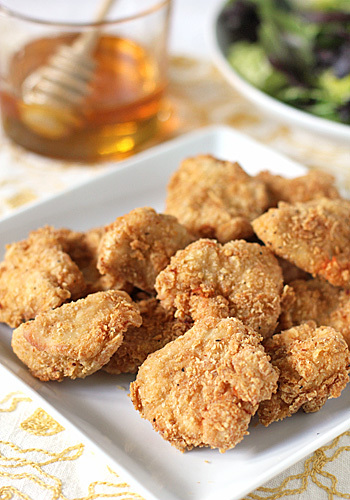 Coat the chicken pieces with egg whites. 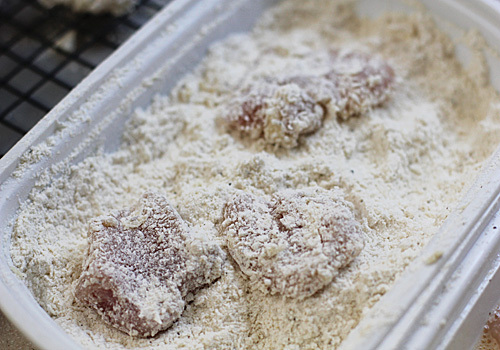 Then dredge in the seasoned flour/panko mixture; pressing to adhere. Do not discard the remaining flour/mixture. 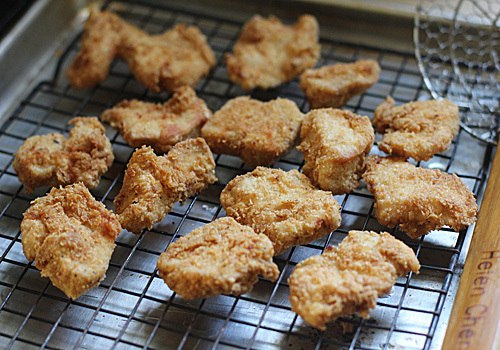 Place the coated chicken pieces on a wire rack set over a rimmed baking sheet and allow to rest for 10 minutes. 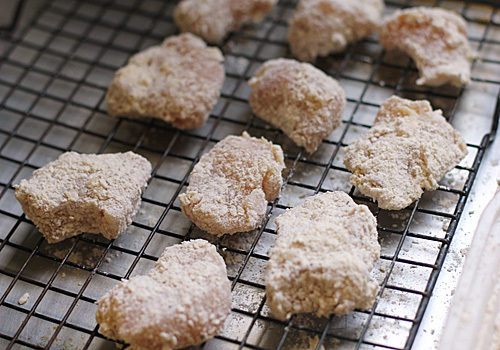 Just before frying, return the chicken pieces to the flour/panko mixture and lightly dredge again. 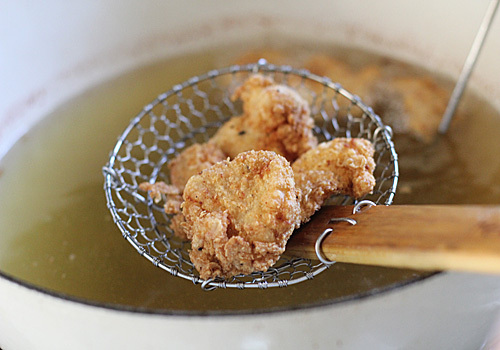 In a large dutch oven, heat the oil to 350° F.
Place half the chicken pieces in the oil and fry until golden brown, flipping once, about 3 minutes. 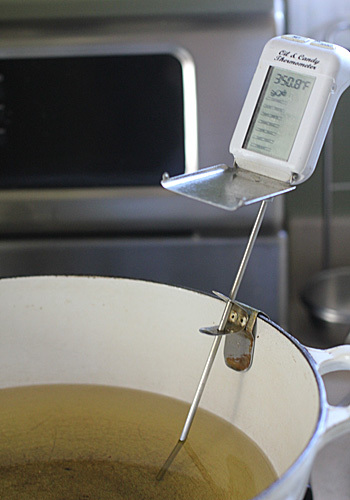 Remove the chicken from the oil (I like to use a Chinese skimmer) and return the oil temperature to 350° F before frying the second batch. 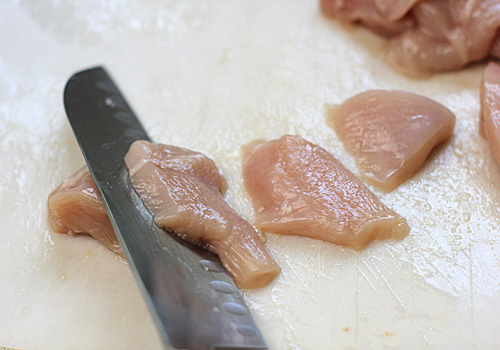 Drain the chicken on a separate wire rack set over a rimmed baking sheet. Keep warm in a 200° F oven until ready to serve. 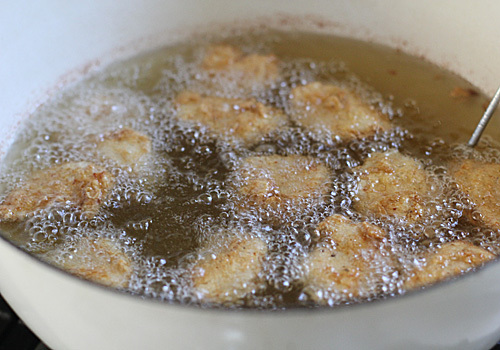 Since the nuggets take little time to fry, I make a double batch. 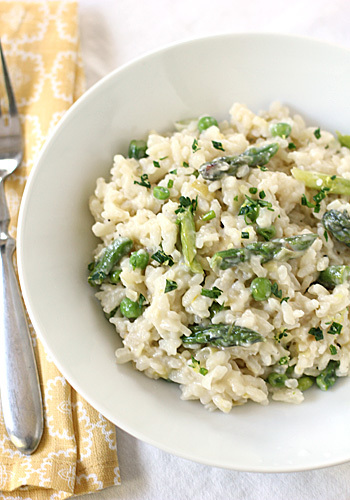 One for dinner and one to freeze for a busy weeknight. 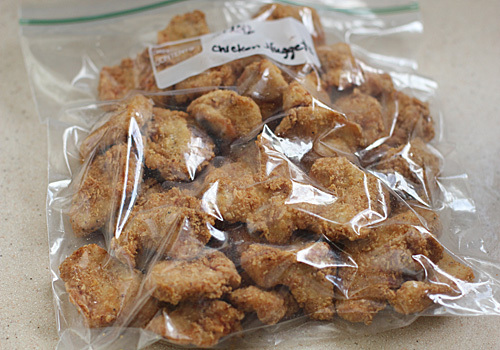 To make ahead, cool chicken nuggets completely, transfer to a freezer-safe ziploc bag, and freeze for up to 1 month. Reheat in a 350° F oven for 15 minutes or until heated through. I like to serve them with a drizzle of honey, but feel free to use any dipping sauce, like barbecue, ranch, or honey mustard. Let's be honest--your kids will probably drag them through a red lagoon of ketchup. A nice green salad and some seasonal fresh fruit completes the meal. Next to a roast chicken and potatoes, roast lamb with beans is one of my favorite Sunday dinners. 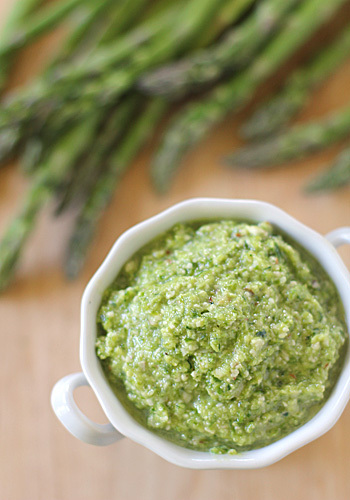 It is simple, classic, and delicious. The common thread between the two meals is something chocolate for dessert. 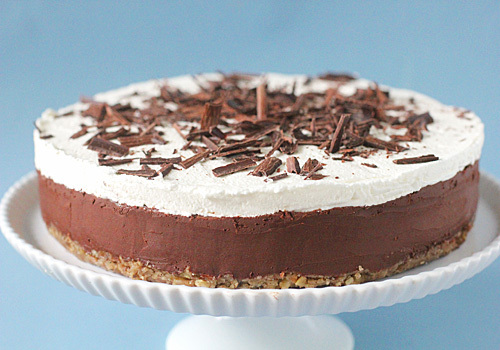 Despite the familiar name, this is no ordinary chocolate French Silk dessert. Pudding poured into a pie crust this is not. If you are looking for a French Silk dessert pushed to the very edges of texture and flavor, you will have found it upon tasting this torte. Notice that it serves 12 to 16. You don't need to eat a doorstop sized piece of this deeply rich dessert to fully experience it in all of its decadent glory. Generally I associate citrus fruits with the winter months, but when it comes to lemons, I embrace them during the Spring and Summer months as well. 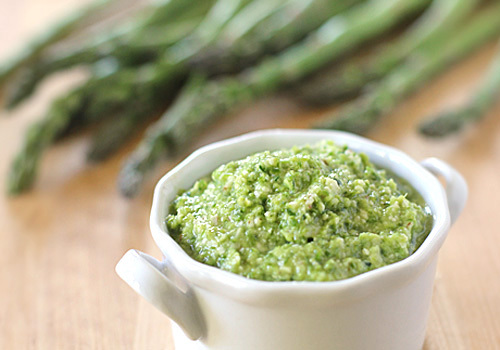 They pair so well with the seasonal fruits like rhubarb, berries, and melon. They help make a refreshing cold beverage. And don't forget about that lemon curd. But since it is still early Spring and the rhubarb in my garden is not quite ready and the berries and melon in the market are not at their peaks, I hoard most of them for baked goods recipes. 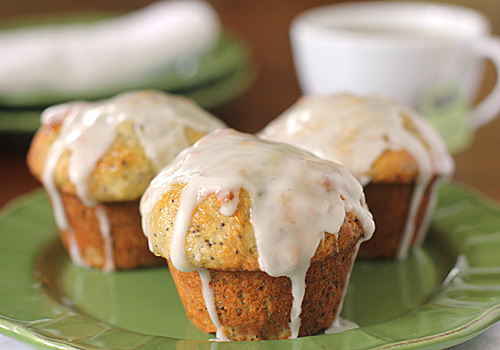 Prior to last week, I had a go-to lemon-poppy seed muffin recipe that I loved. When I came across this one, however, I knew it was time for a change. 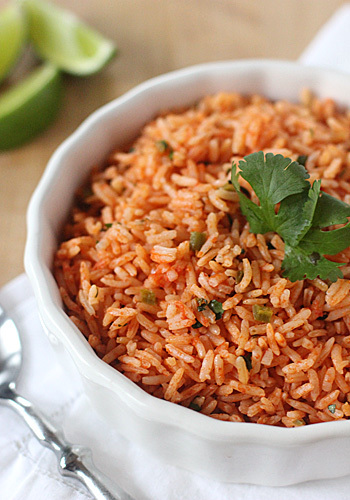 It is similar to the recipe that I had used before, but it uses yogurt in place of sour cream. 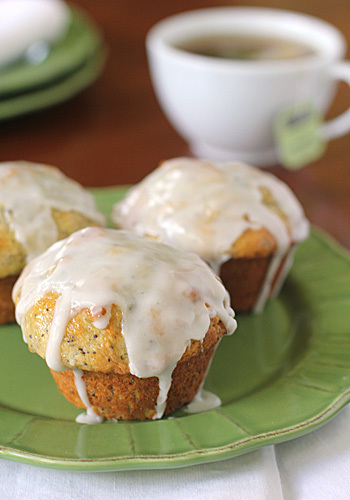 Instead of adding the lemon juice to the batter, the lemon juice is reserved to make a syrup to brush on the muffins while they are still warm from the oven. This keeps the already perfect crumb moist and tender. I added a little vanilla because I rarely bake something sweet without it. Like the corn bread, I let the batter rest a few minutes before filling the muffin tins. 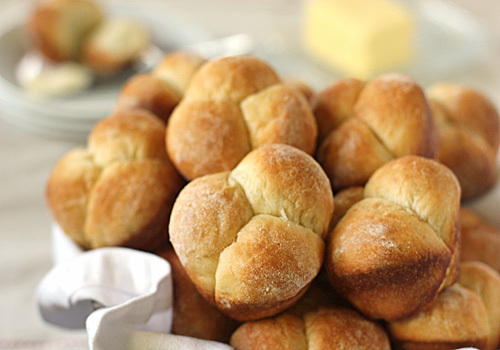 This allows for a perfect bakery-style muffin crown. And if that wasn't enough, I drizzle the top with a lemon sugar glaze making it a perfect balance of sweet and tang. I now...introduce to you...the ultimate lemon-poppy seed muffin! I am willing to bet that many of you have a fair share of ham left over from the weekend. As much as I love a simple ham and mayonnaise sandwich, I do like to use the leftovers in other ways. 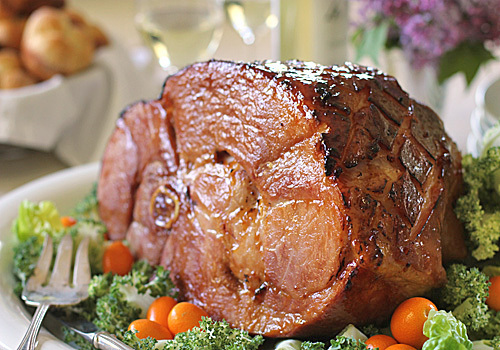 Here is a recipe that uses that ham in a unique and tasty way. The bottom crust is a basic pie crust while the top is puff pastry. I prefer to use homemade pastry (recipes I will get to soon), but you can certainly use store bought versions with good results. Do try to find an all-butter puff pastry. It really does make a difference. The pie crust is pre-baked and cooled in a tart pan. I make the filling as a lightened version of the original using half-and-half in lieu of heavy cream. 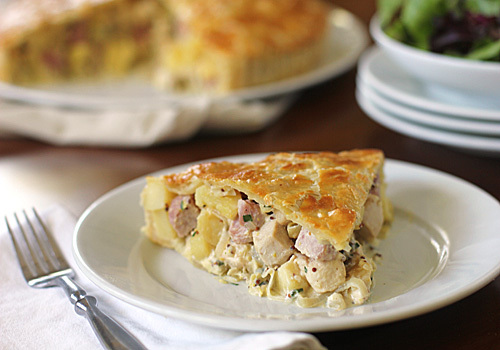 Topped with a sheet of puff pastry and baked until golden brown, this is an excellent way to make use of leftovers. 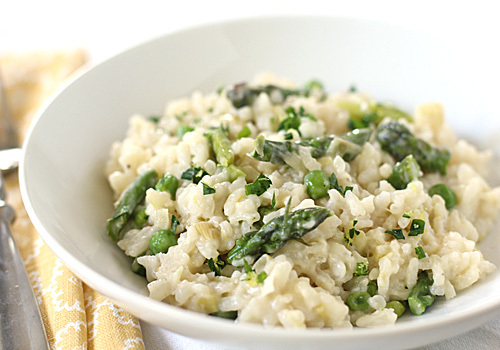 We enjoy it for dinner with a nice green salad, but it could certainly prove a welcome dish for a light lunch or brunch. I like to keep this blog all about food, but I couldn't help sharing a picture of my newest taste tester and reason why it is a good thing that I am not hosting dinner this Sunday. Look what the Easter Bunny left me in my basket! 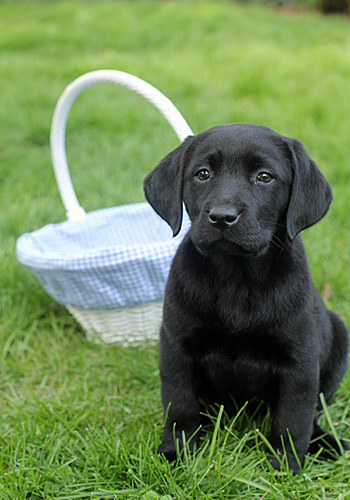 You may know that I already own a 4 1/2 year old black lab named Niecey (the niece of my previous black lab). My children and I felt it was time to crowd the galley kitchen floor even more with the addition of this little puppers. My husband finally relented (he's a dog lover anyway so it wasn't that hard) and we are all absolutely smitten with her, but also adjusting to late night howling and potty breaks. Now about that menu... 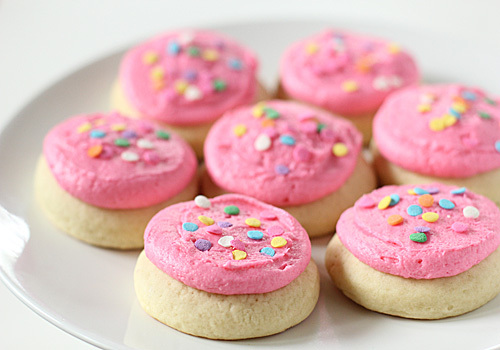 There will be the main event, ham, as well as other sides and dishes along with my contribution of rolls and these tasty cookies--um, cakes, er cakies. Many of you probably recognize these treats. Front and center in the bakery section of the market, they feature different colors for whatever season it is----orange for halloween, green and red for Christmas and pretty pastels for Easter. 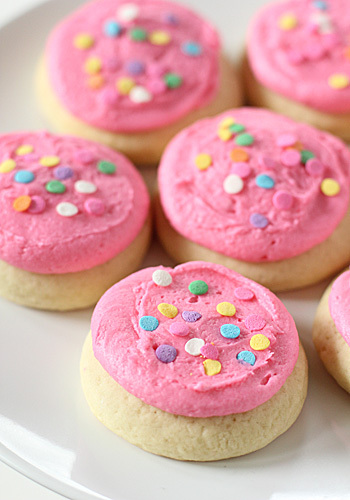 I always have found the taste and texture of these store bought cookies wanting. From the off putting dryness of the cookie to the artificial, preservative laden character of the frosting, it all seemed like a wasted chance for something really good. I gave the homemade version a go in my kitchen and my testers approved. I hope yours will too. 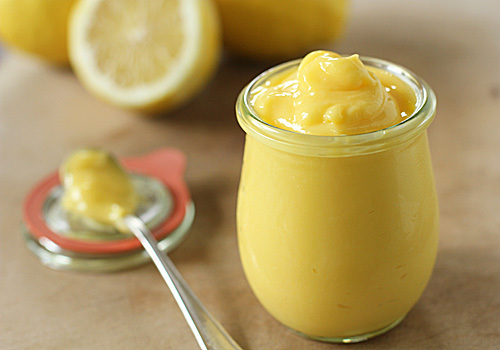 Oh, Meyer lemon curd, how I love thee. However, I do wish you would change your name. Curd sounds like..., well uh..., I'll let you fill in the blank. Custard would be a more suitable description of your taste and texture. 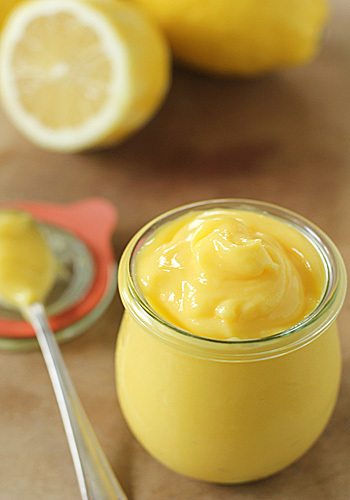 If you have never had the pleasure of enjoying a taste of lemon curd, you are in for a sensational treat. Thick, soft, creamy and spreadable, this curd is a perfect balance of tangy and sweet. I use it to fill tarts, cakes, and eclairs. I serve it with cakes, scones, and cookies. I also fold it into whipped cream, ice cream, and yogurt. I even eat it by the spoonful when no one is looking ☺. Other than the Meyer lemons, the ingredients are basic and you probably have them on hand; butter, sugar, and eggs. The technique, however, is the key ingredient to the recipe. Rushing a curd over too high of a heat will cause the eggs to scramble. Stick to a slow and slow game plan and you will be lusciously rewarded for your patience. Once asparagus has arrived in the markets, it is officially Spring in my kitchen. 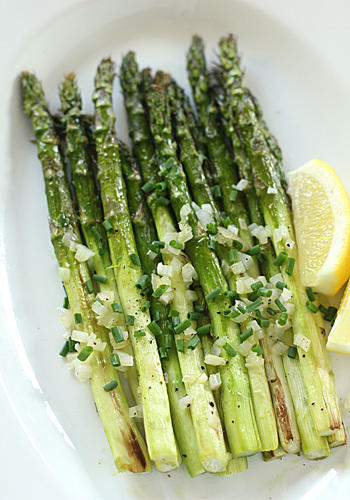 Asparagus can be prepared raw, steamed, blanched, pickled or one of my favorite ways--roasted. It's odd that such a tender vegetable could withstand the high heat of the oven, but it works. To keep the spears from caramelizing into nothingness, I use large, thick spears. I save the slender ones for pastas, pestos, and tarts. 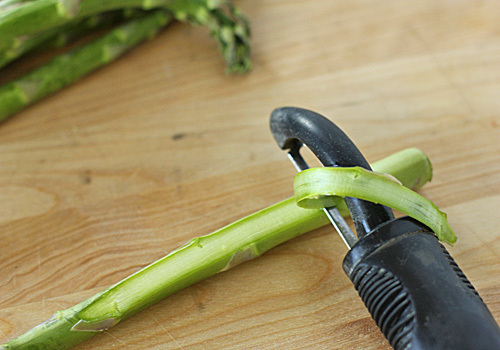 The thick spears are just as tender as the slender variety, as long as they are peeled. While many of you are probably familiar with the snapping of the ends, I want to share a great all-in-one method that peels and removes the tough ends. 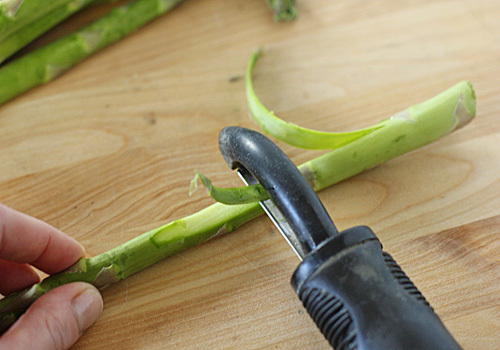 Start by laying the asparagus completely flat on a cutting surface and pinching gently to hold about one-third of the way down the spear. 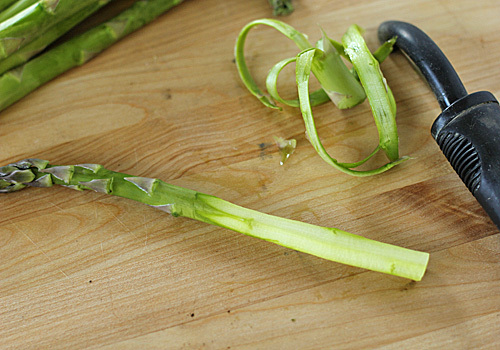 Using a vegetable peeler, peel down the length of the spear until the peeler stops. 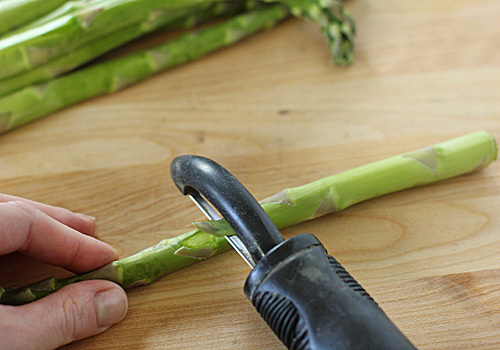 The tough part of the spear stops the peeler. 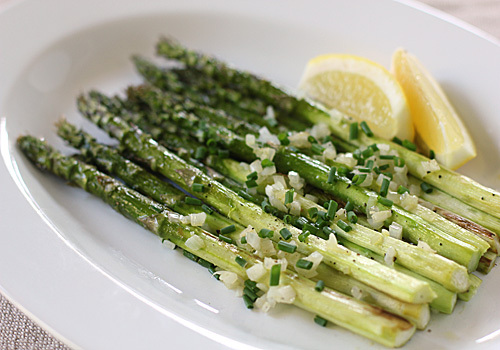 You are left with an asparagus "flower". 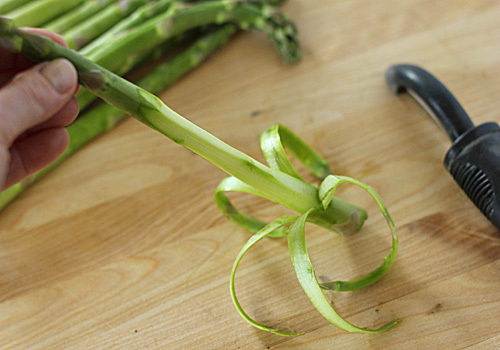 Snap the asparagus off at the end of the peel for a perfectly tender spear and proceed with a yummy recipe like the one I am sharing today. 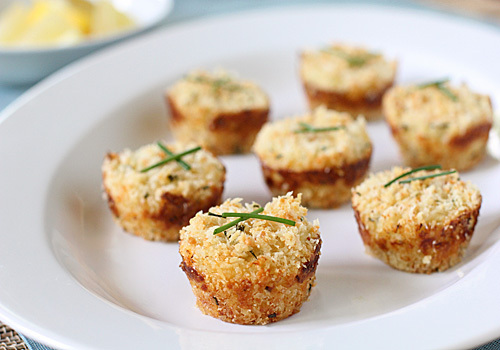 With just a little olive oil, shallots, chives, and fresh lemon wedges, this wonderful recipe and super quick roasting method makes for a delicious first course to a meal or an excellent side to some of those baked hams that will be appearing on tabletops this coming weekend.